My expert interview today is with Jim Bear from The Referral Stream. If you depend on referrals in your business, you're going to love this. Kevin Donlin: Jim, I'm so happy to talk with you today. Your tips on getting more referrals work like crazy and I literally put them in the bank every week, in the form of new business that I would have otherwise never received. If there's time, I want to talk about the $30,719 in revenue you helped me get from ONE referral, but without further ado, welcome to our interview! Kevin: One of your concepts is called, the referral partner. You want to introduce people who may not be familiar with it? Jim: The gist of referral partners, is learning to network with the right people who can send you clients on a regular basis. How many times have we been in those networking events where there's a room full of people and it's like, okay, who do I spend my time talking to and who's going to send me business out of this room and sometimes it's a filtering process that just takes a lot of time to do that. So the model that I like to use when we're out networking is to think of yourself as the orthodontist and go out and find a dentist, because a dentist is a great referral partner for the orthodontist. If you understood who your "dentists" are, these are professionals that are going to know about your next client before you do and get to some other questions we're going to roll out when we get together on the 14th of June. We're going to dive deeper on that concept so you know when you're out networking who you should be spending time with in a group networking setting and even on a one-to-one networking setting. Another way of thinking about this is it was brought to my attention the other day when I was shopping at Target. They have some of their boxes if you go to like the furniture section or the sporting goods section, the really heavy items, they've got a picture on that box and it's called a "team lift." It's a picture of two people lifting this box and what they're trying to communicate to the consumer is "Don't lift this on your own, this is too heavy – ask one of our Target personnel to help you lift this." In fact, they'll bring two people out to team lift it, probably right out to your car. And when I saw that, I thought, "You know, that's really a referral partner in networking." If you can network with professionals who will do some of the heavy lifting with you, it's so much easier than trying to do everything on your own. So we're going to drill down deeper on that on June 14th and talk about who you should be team lifting with in your networking efforts. Kevin: That's a fantastic idea. Just as a takeaway people can realize not all networking contacts are created equal. Kevin: And when you know who you're looking for in terms of referral partners, it's like putting on 3D glasses. Whoa! Things change, and you can spot the people you should really be networking with. In fact, using your ideas about referral partners, I have received $30,719 in revenue from just one person I met a year ago. This person is my ideal referral partner, he's my dentist, if you will, to my role as orthodontist. This guy has happily sent me almost $31,000 and counting and I get leads and projects from him almost every week. It's been absolutely fantastic. And it's all because of what I learned from you, Jim. I now look for people upstream of me who see my clients before I do and it's an absolute night and day change in my networking. Because instead of looking for little onesy-twosey projects, I've got this one referral partner, and it's like having an oil well in my back yard. It's just pumping out revenue day after day. I have you to thank for that. What's a good way to get attention? What's a good way to quickly "warm up" cold prospects in your business and turn them into new clients? Send them a message that's impossible to ignore. 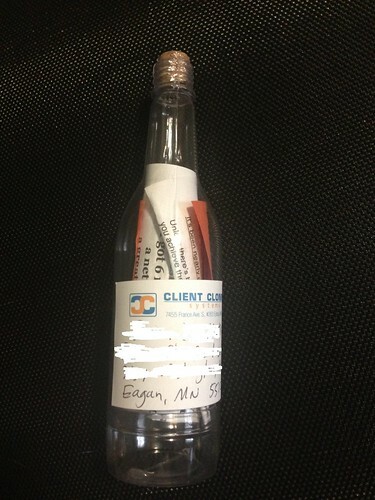 Here's Exhibit A in my arsenal of tools to do just that -- a message in a bottle. Twice in the last few weeks, I've mailed it to potential clients who once seemed eager to hire me, but had fallen silent. Rather than send them email after email, hoping for a response, I spent a few minutes writing a relevant letter and shipped it out in a bottle like the one you see at left. In both cases, response from those cold prospects came the same day -- "Let's talk!" And the resulting revenue from both prospects was in the mid four figures. So, yeah, this works. Four figures is a nice ROI on a bottle and postage that cost less than four bucks. Now, you may not have access to the dozens of direct-mail tools at my disposal. After all, I am a professional copywriter. Getting my letters opened, read, and responded to is how I earn my living. But you can adopt this same idea in your business. If you have leads with high potential value that have gone cold, spend a few minutes and dollars to send them a message they can't ignore. My expert interview today is with Steve Adams, a very successful entrepreneur and business person, and author of the new book, The Passionate Entrepreneur. Kevin: Could you give my readers a quick bio on where you’re coming from? What’s your business background, and why should people listen to you? Steve Adams: Well, that’s a good question. I’m a middle class kid, grew up in Lansing, Michigan, and my dad was a General Motors employee at the Oldsmobile factory for 33 years. I went off to college as one of the first kids in our family going back many years, to ever go to college, and got a marketing degree. I started in the banking business because I thought I could learn more about business as a banker. I got into the commercial corporate side and made loans for 14 years for three different banks and got a great training there about how to evaluate businesses and industries and management teams, and really fell in love with entrepreneurship as a banker, because I worked with so many bright ones and some not-so-bright ones where I learned about what not to do. Then in 1995 I looked into the Pet Supplies Plus franchise. It’s based out of Detroit, Michigan. At the time, it only had about 70 stores. Today it’s about 300. Today we have 21 stores and a little over 400 employees and I just really enjoy what I do every day. It’s just been one day at a time, making mistakes, overcoming them, paying for them. I wrote my book as a means to train my staff as well as share our story with a broader entrepreneurial market. Kevin: So you’re someone people really have to listen to. You’ve experienced tremendous growth, you’ve got a whole lot of life lessons to share, you’re doing a lot of things right. Let’s talk about one of your employees, we’ll call him Tony. You told me before our call that he had lost his mojo. Talk about Tony’s problems, how you helped him turn things around, and the lessons that could hold for other entrepreneurs. Steve: Well, Tony worked down in Tuscaloosa, Alabama. We acquired some stores down there and he was part of the prior ownership group. They were just kind of classic old school business people where they were only focused on costs and they didn’t invest in their people and so he had worked for the company for seven or eight years, and then when we purchased the company, we had quite a bit different culture than what they had. One of the things I like to do is have ample face time with store managers, because they are the key people in our entire company, and Tony told me, “Steve, when you come, I’m excited for three weeks, and then I lose my focus.” And I found this was not just a problem for Tony, so I met with one of my friends who owns a company and really, I learned the following process from him. The idea is that whenever we start something new, we’re excited about it and there’s a lot of learning that happens right away, so there’s a sharp upward trend in our growth. And then when it starts to get a little bit hard, we start to lose focus and ambition. And that’s where we were with Tony and, frankly, with all of our managers in that new market -- they were having a hard time staying motivated long enough to do what we asked them to do. So the thing I learned from my business-owner friend is to have all of your leaders give their personal, professional and financial goals, and teach them about how to pursue them. Your readers are probably familiar with goals that are SMART: specific, measurable, actionable, realistic, and with a time frame. The team created SMART goals and I met with each one of them. Tony was particularly enthusiastic about this and what I found out through this process (combining personal, professional and financial goals) was that he wanted to move to Mobile, Alabama, which is where he is from. So I explained to Tony, “This is what’s going to happen now, you’re clear about what you want, and you have a strong why behind it.” And his why was, he wanted to move his kids to where he was from, where his parents were, so the kids would have grandparents and there was a private school there he wanted them in, and all of these things that ended up cascading and creating a very strong sense of purpose. Then I said, “The only thing missing now, Tony, is a specific set of steps.” And so our regional manager helped him established the steps, because we couldn’t just move him, we had to train a team to replace him. So that’s the process we went through. Kevin: How often did you review Tony’s goals with him? Steve: Quarterly. We don’t it quarterly anymore because we’ve been doing this now for three plus years and all of our managers are in this program and have given it a lot of thought, they understand what it is, so we don’t need to meet so frequently on it. But however often you need to, when you find yourself losing steam, a simple thing to do is to step back and ask, “Am I clear about what it is that I want, and do I have a strong why?” If the answer is no to either one of those, you’re going to drift. Kevin: We’ve all heard about goals before, but what I think you’re saying is what’s been missing for a lot of people is the why, because that’s the fuel that keeps you going toward that goal. And for Tony, until he got clear about moving to Mobile near his family, he didn’t have the juice to stay motivated and keep going forward. So you’re saying when you get clear on your why for your goal and you commit to regularly reviewing your goals, you’ve seen it increase motivation among your employees? Steve: I have, Kevin. Anybody can sit and write down five goals, but if you don’t have a clear purpose about why you’re doing them, and a clear road map -- an action plan -- to achieve them, it’s just a dream, it’s a fantasy. So you’re going to have your own personal, professional and financial goals that you’re working; you’re going to have a set of goals for the store; and then a monthly goal review process with each one of the employees. And we’ve cascaded those into all three levels and that has enabled us to have performance that we’ve not seen before. Kevin: So, did Tony get his mojo back? Steve: Yes! About six months later, there was an opening at the store in Mobile for him, and I remember how excited my regional manager and I were to tell Tony. He had done everything he was supposed to do and he had trained his replacement. But the interesting thing was his replacement had a goal of wanting to run the Tuscaloosa store because that’s where she had grown up and that’s where she wanted to stay for her whole career! It was really exciting because it was a double win. And Tony got there in January of 2011 and today the store is doing more than 50% higher sales than it was before he took over. Kevin: Wow! Very cool. Okay, let’s break this down and finish up. If you’re talking to an entrepreneur who wants to get to your level of success, what are their takeaways based on what we’ve just talked about? Steve: Kevin, what I would say is as an entrepreneur you have to be clear about what it is you want. If you’re in a job, in a corporate job and you want to become an entrepreneur, then your whole set of goals should be to identify your opportunity and the launch. In any case, if it’s just for money, you won’t sustain it. I mean, I’m as much of a capitalist as anyone, and I want to do well financially, but I have learned over the years that money alone sustains very few people over a long period of time. So get really clear about what you want, understand why you want to do it, and then when you map out a set of action steps, that’s where you start to confront where I’m going to have to change. If I want to have 8 dry cleaning locations instead of one, or if I want to double the size of my window replacement business, that means I’m going to have to scale up and build infrastructure and develop people. So by going through these steps, you give yourself a much better chance. Kevin: Steve Adams, thanks very much for sharing your insights today. How can people get a hold of your book, The Passionate Entrepreneur? Steve: You can go to PassionateEntrepreneur.com and if you sign up for our ezine, you’ll be eligible for a free copy sometime in the next three weeks. Otherwise you can just go straight to Amazon.com. My expert interview today is with Jeff Prouty, Chairman and Founder of The Prouty Project, a boutique consulting firm started in 1987. Jeff and his team work with clients in areas of strategic planning, organization development, and board and team development. Kevin Donlin: Jeff, let’s talk about strategic planning. It’s a topic that throws a lot of people. When I talk to small business owners or decision-makers at entrepreneurial firms, a lot of them don’t know where to start when it comes to strategy. So, let’s start at the beginning: How would you define strategy? Jeff Prouty: We’ve got a big quote on the wall in our creative think tank and it says, “Strategy is about stretching limited resources to fit ambitious aspirations.” It’s all about choices, and focus, and alignment. Kevin: How do you know when your strategy has succeeded? So, define your objectives to start with. For us, that defining process includes cash flow, so there’s a profitability element, obviously. But objectives should include customer service, customer satisfaction, employee satisfaction, and employee commitment. Kevin: What are some examples of metrics to aim for in a winning strategy? Jeff: It might be that we want to score an 88 percent or better on our annual employee commitment index. Or, we want a score of 75 or better on our customer net promoter index, the percentage of clients who would feel good about referring us to a friend or a colleague. So we want people to think about how employees and customers grade the company. Then, assuming all those things are working, there ought to be profitability and cash flow metrics. Kevin: What time frame do you use to measure strategy? Is it one year, five years, 100 years? Jeff: It varies by client. We’ve got clients who say, “Prouty, I want our team to think out 50 years when my grandson, is running the company.” And we’ve got clients who want to think out 50 weeks. I think two to three years is a good time frame. And the world is changing so quickly that you have to keep updating and rethinking your strategy every 90 days. Kevin: What common mistakes do you see among clients who come to you for help with their strategy? Jeff: I think lack of focus would be one. Lack of alignment would be another. These aren’t in priority order, but things we see frequently. A third one would be lack of the talent required to do the things they’re trying to do. In other words, we want to win the Super Bowl, but we are weak in some positions that will stop us. A fourth area is accountability. I’m heading out to California next week to work with a $25-million company and one of their issues is they have no accountability for poor performance. They expect folks to do things but they don’t deliver, and yet they get to stay on the team, or they’re not able to coach those folks to improve their performance. Now having said all that, we’ve got another quote that we like, from T.J. Rodgers, the CEO of Cypress Semiconductors, who said, “Most organizations don’t fail for lack of talent or lack of vision. They fail for lack of execution.” So a lot of folks know what they need to do, but they don’t execute. They don’t put rituals in place to do the things they need to do to achieve the goals. Kevin: That idea of execution is so important -- the best strategy on earth does you no good if it’s not executed. How can people be more accountable and execute their strategy? Jeff: Laser focus. Do 3 things really well versus 10 things kind of well. Focus includes people. I hear lots of clients say, “We want to have two people as the co-champions of this,” and I always say, “Co-champion means no champions.” I want one person with accountability. It doesn’t mean they have to do all the work, but they need to own the initiative so that they are accountable -- did we or did we not achieve that? I think if I were to boil down all the feedback I see, it’s that people have too many priorities. They’re trying to juggle 12 balls when they ought to be trying to juggle 3. Kevin: Jeff Prouty from The Prouty Project, thank you very much!